Color Champion at 6 months old! 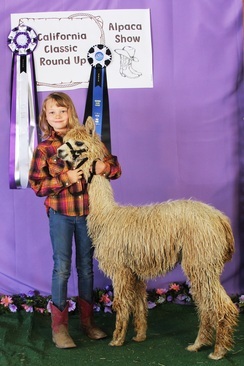 West Coast Alpaca Show Auction Girl!!!! Rogue Thunderstorm is beautiful! Born during a really bad storm, I guess mom just knows how to pick the best day to have a Cria! This little girl is locking very nicely thanks to her dad NGG Thunderhead. Conformation is excellent and this little girl is growing like a weed. Carrying excellent luster and heavy bone I believe Thunderstorm is going to be a big girl! She is white on the body but carries a large fawn dot right on the top of her head. 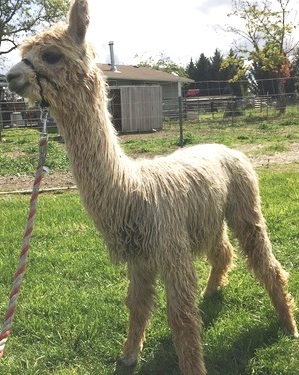 Thanks to mom who is a vicuna color, I believe Thunderstorm will carry color! Yay! 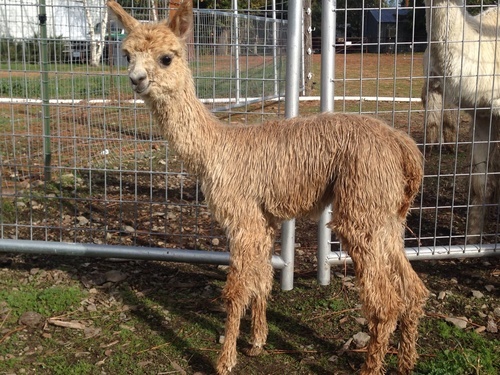 Thunderstorm has given us a gorgeous fawn female out of GLR Nico! Her first Cria Riesling by Nico was the Light Female Color Champion at California Classic 2015 at just 6 months of age! Sharon Loner remarked her incredible handle and fabulous luster was abundant throughout her fleece! 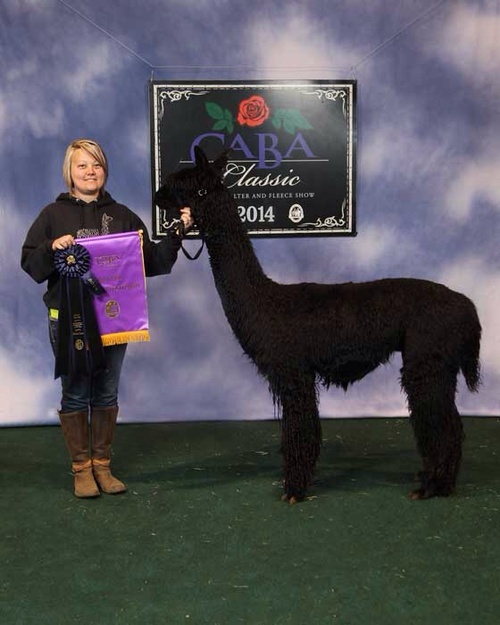 Thunderstorm is offered open but we will throw in a breeding to ANY Rogue Suri Alpacas herdsires! 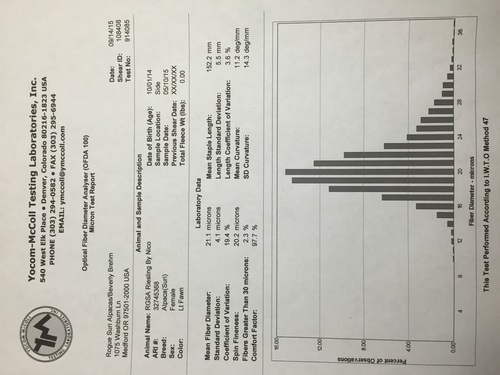 Do not miss this opportunity to own a Champion producing DAM! She is an incredible steal at this price! 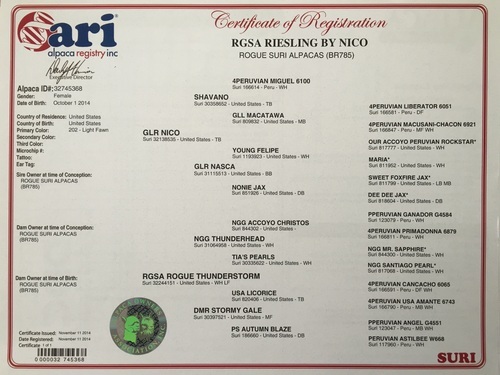 Riesling is being offered at the West Coast Alpaca Show Saturday Night Auction!! This girl would be a fabulous addition to any Serious Suri Breeders lineup of foundation females. This girl is just dripping with LUSTER!!! At her very first show the California Classic Sharon Loner stated "It's hard to not to keep touching this girl!" Riesling is well on her way to a very productive show career, already a Color Championat 6 months! In May we sheared Riesling after the CABA Classic 2015 and her regrowth is stunning!!! Get your hand in the air for this girl, she is going to knock your socks off!